Anyone can experience an accident in life that can disrupt their financial situation. Normally, creditors wait for six months before making this declaration and if the consumer is not able to make payments for six months, the debts are charged off. Most borrowers think that if they have outstanding charge offs and collection accounts, they cannot qualify for conventional loans. However, the requirements of Freddie Mac and Fannie Mae are stringent and tougher than that of the United States Housing and Urban Development’s (HUD’s) for FHA loan. Each mortgage program has different guidelines when it comes to charge offs, late payments, judgments, tax liens and collection accounts. The FHA is preferred by borrowers because it has lenient guidelines on charge offs and collections. According to the updated FHA guidelines for charge offs and collections, home buyers don’t have to pay their outstanding charge offs and collection accounts in order to qualify for an FHA loan. Borrowers can qualify for an FHA loan with outstanding judgment and tax liens without paying them in full. Requirements of the FHA are also lenient for those borrowers who filed bankruptcy. Borrowers can qualify for an FHA home loan even with bad credit. But, timely payments in the past 12 months are mostly required for approval per Automated Underwriting System (AUS). The FHA realizes that borrowers can have bad credit periods, but it requires them to reestablish their credit by making timely payments before they can qualify for an FHA loan. According to the guidelines of Fannie Mae, on the credit report of consumer all credit accounts reported past due which aren’t reported as collections accounts need to be brought up-to-date and current for the borrowers in order to qualify for a home loan. If you want to purchase a second residential property or 2 to 4 unit owner occupant residential property, outstanding non-mortgage charge offs and collection accounts that are more than $5000 must be paid completely at closing or before it. The mortgage lending guidelines of FHA does not require borrowers to pay off their outstanding collection accounts. For example, if you have a total of $12,000 outstanding collection accounts balance, then 5 percent of the total unpaid $12,000 collection account balance or $600 will be used for calculating your debt-to-income ratio, but you don’t have to pay $600 per month. Many borrowers fail to qualify for conventional loans from mortgage lenders or banks because of outstanding charge offs and collection accounts. Why does this happen when conventional mortgage guidelines for collections and charge offs don’t put these conditions on borrowers? The reason many lenders and banks require borrowers to pay off their outstanding collection and non-mortgage charge off accounts in full and have a waiting period before borrowers can qualify for a conventional loan is because of overlays. Lender overlay is a major issue for borrowers with outstanding collections and charge off accounts. It not only restricts them from qualifying for a conventional loan, but also makes it hard for borrowers to qualify for an FHA home loan. In addition to this, lenders also tell other things that are not included in the FHA guidelines. When it comes to unpaid charge offs and collections, judgment and tax liens, mortgage guidelines of conventional loans are very different than the guidelines for FHA or apartment building loans. In a nutshell, if you have outstanding unpaid collection and charge off accounts, then you should consider an FHA home loan as FHA guidelines for collections and charge offs are more lenient. But, if you wish to go for conventional loan, you must fulfill all the stringent requirements. If you have been denied a home loan or have any questions about real estate or mortgage please contact the author Gustan Cho of Gustan Cho Associates at Loan Cabin Inc. at 262-716-8151 or text us for faster response. Or email us at gcho@loancabin.com. The Gustan Cho Team at Loan Cabin Inc. works when you work, so feel free to contact him any time. 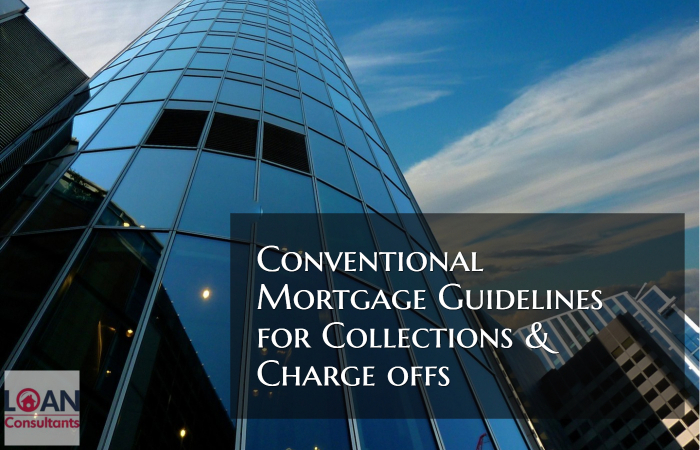 This BLOG On Conventional Mortgage Guidelines For Collections Was UPDATED On January 2nd, 2019 By Gustan Cho, National Managing Director of Loan Cabin Inc. and Massimo Ressa CEO of The Gustan Cho Team at Loan Cabin Inc.